Are you looking for lost of exciting activities? Do you want to experience the best Japan has to offer? And do it all as a family? 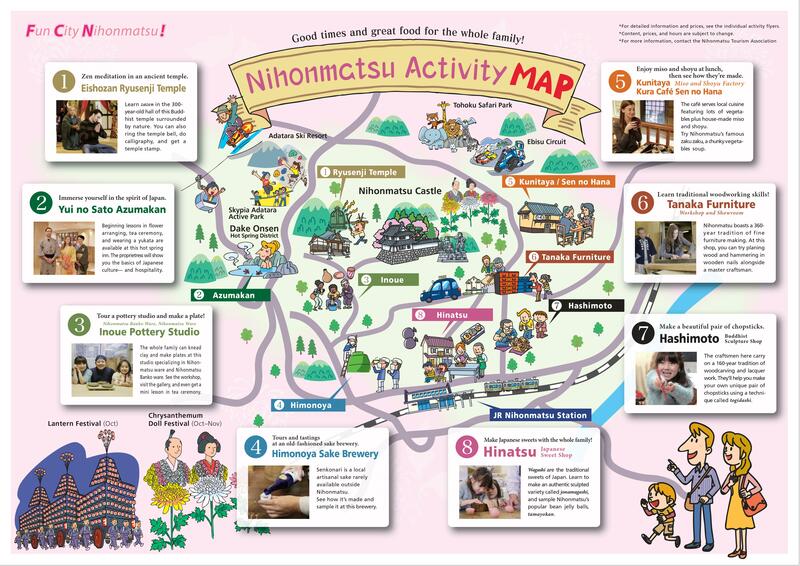 you’ll find what you’re looking right here in Nihonmatsu,where there’s always lots do,see,and learn. Learn zazen in the 300-year-old hall of this Budd-hist temple surrounded by nature.You can also ring the temple bell,do calligraphy,and get a temple stamp. Beginning lessons in flower arranging,tea ceremony,and wearing a yukata are available at this hot spring inn.The proprietress will show you the basics of Japanese culture – and hospitality. The whole family can knead clay and make plates at this studio specializing in Nihonmatsu ware and Nihonmatsu Banko ware.See the workshop,visit the gallery,and even get a mini lesson in tea ceremony. Senkonari is a local artisanal sake rarely available outside Nihonmatsu.See how it’s made and sample it at this brewery. The café serves local cuisine featuring lots of vegetables plus house-made miso and shoyu.Try Nihonmatsu’s famous zaku zaku , a chunky vegetables soup. Nihonmatsu boasts a 360-year tradition of fine furniture making.At this shop,you can try planing wood and hammering in wooden nails alongside a master craftsman. The craftsmen here carry on a 160-year tradition of woodcarving and lacquer work.They’ll help you make your own unique pair of chopsticks using a technique called togibasi. Wagashi are the traditional sweets of Japan.Learn to make an authentic sculpted variety called jonamagashi,and sample Nihonmatsu’s popular bean jelly balls,tamayokan. © Copyright 2019 二本松商工会議所. All rights reserved.